Eastern sophomore Tessa Rockhold releases a pitch during the Lady Eagles’ TVC Hocking win over Waterford on Friday in Tuppers Plains, Ohio. 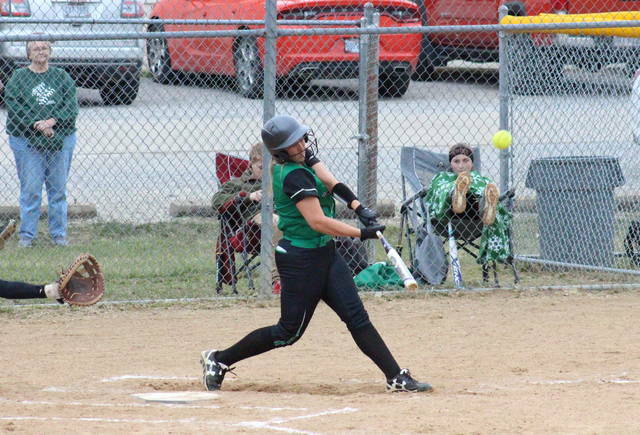 Eastern senior Kelsey Casto swings at a pitch during the Lady Eagles’ 6-3 victory on Friday in Tuppers Plains, Ohio. TUPPERS PLAINS, Ohio — A power surge at precisely the right time. 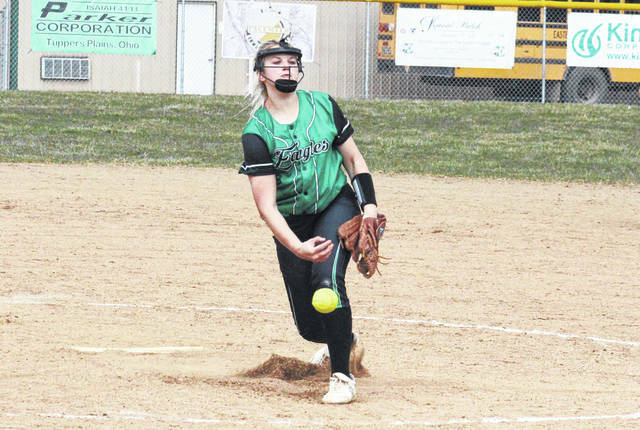 The Eastern softball team defeated Tri-Valley Conference Hocking Division guest Waterford by a 6-3 count on Friday at Don Jackson Field in Meigs County, with EHS seniors Mollie Maxon and Cera Grueser each blasting a two-run home run in the win. 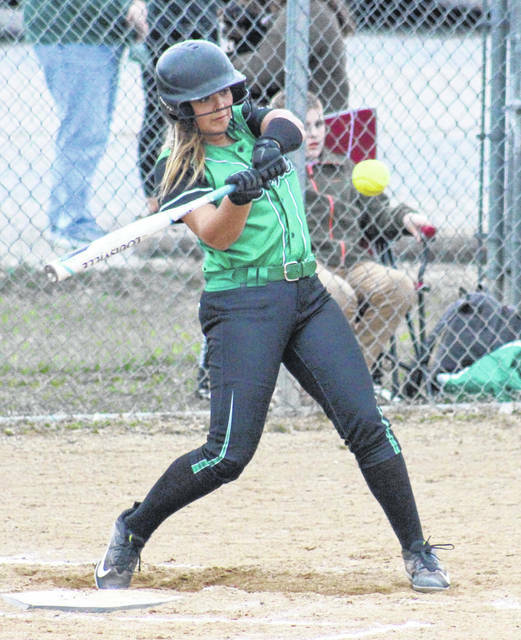 Eastern (3-0, 3-0 TVC Hocking) — winner of seven straight league games dating back to last season — broke the scoreless tie in the first inning with Grueser scoring on a two-out Kelsey Roberts single. Eastern left two runners on base in the first, however, and then stranded three more in the second. The Lady Eagles put another runner on third om the bottom of the third, but were still unable to add on to the 1-0 lead. The hosts ended their two-inning drought in the bottom of the fourth, when Grueser blasted her two-run home run, making the edge 3-0. Waterford loaded the bases with one out in the top of the second inning, but had its next eight batters retired in order. WHS ended the shut out in the bottom of the fifth frame, and then scored twice more in the top of the sixth, tying the game at three. Eastern reestablished its advantage with one out in the home half of the sixth, as Grueser singled home Casto. In the very next at-bat, Mollie Maxon launched her two-run homer, increasing the EHS lead to 6-3. 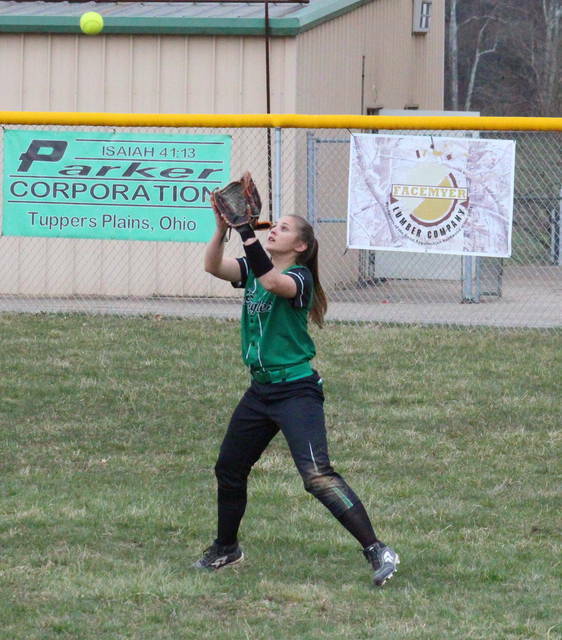 A one-out double and a two-out walk brought the potential tying run to the plate for WHS in the top of the seventh, but a flyball to Kennadi Rockhold in center field ended the game. Following the 6-3 victory, sixth-year EHS head coach Bryan Durst acknowledged some areas his squad needs to work on, but was glad a pair of seniors stepped up to save the day. Coach Durst talked about the leadership his seven seniors have brought, with five of them in their fourth varsity season. Tessa Rockhold was the winning pitcher of record in a complete game for Eastern, striking out three batters and allowing three earned runs on five hits and six walks. Smith pitched a complete game for the guests, allowing six runs, four earned, on 11 hits and a walk, while striking out one batter. Roberts was 3-for-4 with an RBI in the win, Grueser was 2-for-3 with a home run, three runs scored and three runs batted in, while Mollie Maxon finished with a home run, a run scored and two RBIs. Casto, Emmalea Durst, Megan Maxon, Tessa Rockhold and Kennadi Rockhold each singled once in the win, with Casto scoring a pair of runs. Offenberger led Waterford’s offensive attack, going 2-for-3 with a double. Neader and Young both singled once and scored once, Baldwin singled once and drove in two runs, while Tornes crossed home plate one time in the game. The Lady Wildcats and Lady Eagles are scheduled to clash again on April 15 in Washington County. After a pair of non-conference bouts on Saturday, Eastern will resume play in the TVC Hocking on Tuesday at Wahama.